In 1937, the year in which the company was established, the European printing trade was dominated by letterpress printing techniques and predominantly had the structure of a craftman's trade. Taking as a basis his experiences gained in America, Joseph-Otto Bobst, the younger brother of Henry Bobst who was to be responsible for the spectacular development of Bobst S.A. in Lausanne, turned his attention to the problems of rationalisation that existed in letterpress printing. He set himself up as an independent businessman and founded FAG (Fournitures pour les Arts Graphiques), giving it the legal form of a limited company. As a first step, the new company took over American agencies for block and lead type finishing. However, the company made a name for itself by its ambitious and consequential development fo the FAG Form-Test-method. This method rapidly became established in leading printing companies and is a patented trade mark. The aim of the FAG Form-Test was the preparation of a printing forme that was as perfect as possible outside of the production press, including makeready and final proofing, in order to reduce non-productive press times. In this way, FAG became synonymous with rationalisation and more efficient printing. After the Second World War, as a sales organisation and initially without its own manufacturing facilities, FAG took advantage of the Marshall Plan by importing American machinery, in particular Vandercook cylinder proof presses, to Europe. They also built up FAG agencies in Germany, Italy, France and England. With a network of exclusive agents in Europe and overseas, as well as competent consultacy and reliable service, FAG aquired a reputation of being a respected service company throughout the printing industry. In doing so, the company made an important contribution to raising standards of quality as well as to the industrialisation of the industry. In the year 1946 they started to build their first machines in Germany (Singen) and France (Lyon, Annecy). In the 1950's, FAG Form-Test saw the need to adapt the American equipment to the new, European needs. Also they needed to keep up with the growing industry in Germany. The recognition by the french governement of FAG as a national export company proved to be a stroke of good fortune. Among other benefits, it enabled FAG to sell and put into operation the first Klimsch reproduction cameras in Paris. In that same time, they also expanded their business to Yugoslawia and the eastern part of Europe. FAG cylinder proofpresses, plate- and leadsaws, lead mound casters, register galleys, plate and plate mounting gauges, type height and slug gauges, high speed blocklevelers and alot more tools and machines accelerating the pre press process where selling good but still manufactured at several facilities abroad. Thats why FAG built their own manufacturing facilities in in the beginning of the 1960ies in Avenches (CH) just 50km from Lausanne. The site was located on historical ground, which delayed construction somewhat. FAG facilities in Avenches, Switzerland in the late 1960ies. In 1962 , the first part of the plant was put into operation. It was already in 1964, when they had to double the capacity of that building. 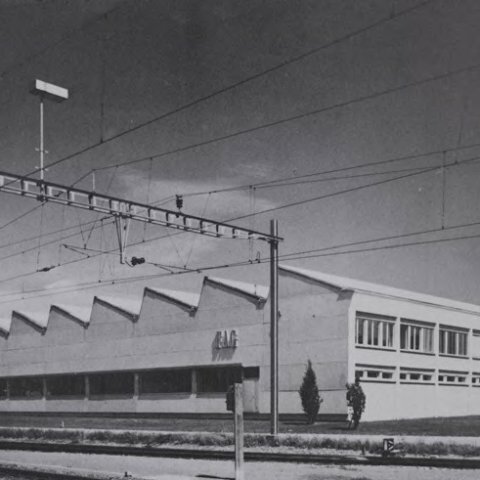 From that time, they manufactured all their products for the FAG Form-Test-Method in their own facilities in Avenches. The commerical replacement of the letterpress process by offset printing, beginning in the early 1970ies to the mid 1980ies has led to the known changes in printing industries and also changed the technical needs for proofpresses. In 1972 FAG delivered their first flatbed offset proofpress the ‹7654› from Avenches. The changes from the production of letterpress proofpresses to the offset proofpresses was completely smoothly and FAG seemed to be very agile in reacting to the new needs of the industry. For Drupa 1977 FAG presented the next milestone in their history: the FAG OP-104. A flatbed offset proofpress in the printing size 72x104cm. It was the worlds first offset-proofpress with interchangeable inking units, which really cut washup time between colour changes massively. Until the year 2000 approximately 1500 OP-104 have been delivered from Avenches. In 1985 FAG developed its last proofpressmodel to be produced in Avenches. The Speedproof 4C, a four colour rotary proofpress, which often has been modified to a production press. Around the year 2000 FAG started their cooperation to build the FAG- Korrex 2000, another flatbed offset proofpress to be (and still today) manufactured by the Max Simmel facilities in Germany. Simultaneously to their developements in offset proofing since the early 1970ies, still with that vision of the Form-Test-Method (nowadays better called ‹quality control›) FAG started to develop and is still very active today in the production of densitometers for almost any part of the printing industries. Since today, offset proofing can be very much simulated with inkjet and is only still demanded in very specialized parts of commercial printing industries like money printing and metal and other packaging production, FAG went back to have their new qualitiy control tools produced (of which only a small part is still actually proofing-systems) in different specialized manufacturies abroad. Between 1962 and 1991 about 2000 letterpress cylinder proofpresses have been built in Avenches. Last larger letterpress proofpress order was in the year 1991, when 15 FAG Control 405 have been produced for Russia. In 2009, the manufactury in Avenches has been cleared out and closed down. New offset proofpresses (FAG-Korrex 2000) are built in Germany. Full revisions of offset and letterpress proofpresses are coordinated from Lausanne and are made in Payerne, CH. The whole replacement parts archive, productionsheets of all presses manufactured in Avenches as well as all blueprints and schemes have been moved to the headquarters in Lausanne. FAG still has a huge replacement parts archive and all blueprints to produce every part of every press. They will gladly help you with any problems as they can. They still sell their parts for the same prices as they used to be back then – but dont expect them to be very cheap, these are high quality pecision proofpresses, which also would cost between 20‘000–30‘000CHF for a small letterpress proofpress (for example a Control 405) back in the 1960ies.